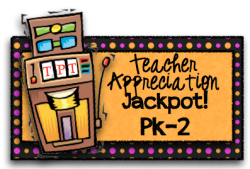 Announcing the Teacher Appreciation Jackpot Linkup! Next week is Teacher Appreciation Week, and Sunday, May 6th is sure to be your lucky day! I'm excited to announce the very first Teacher Appreciation Jackpot, an amazing "blog hop" event involving over 125 bloggers! This page is your starting point for the Grades Pre-K - 2 blog hop, and you can find links to the other levels in this blog post. All of us wanted to show our appreciation for you in a BIG way, so we've all agreed to give away one of our TeachersPayTeachers products for free on that day! Each free gift will be valued at between $3 and $8, so the total jackpot amount is estimated to be over $600! The big day is not until Sunday, but why not take a look at the items in my TeachersPayTeachers store right now? You've probably heard that there's going to be a massive sale on TpT in honor of Teacher Appreciation week, so feel free to load up your shopping cart now. You don't have to worry that you may end up paying for an item if I make it free; if a product in your cart later becomes free, you won't pay anything for it at checkout. Trust me on this! Look below to find links to over three dozen terrific Grade Pre-K-2 blogs where you can download your free gifts on Sunday! We appreciate your commitment to your students and your dedication as an educator! It's our pleasure to give away something for free, and many of us will also be offering 20% off our whole store from from May 6th through the 8th. Thanks so much for all you do! Excited to be following you, especially before this event! I look forward to your freebie! Great choice! OMG! Erin, I cna't believe my luck! Your freebie is what I have had my eye on!! Thanks! Love your freebie. So glad I found your blog. Thanks for the Freebie I had it in my wishlist and now can use it!! I love, love, love finding new blogs! Thank you so much for sharing your super cute product! Love this! Thanks for the freebie! Thanks so much for the fabulous freebie! We are your newest blog and TpT followers. Love this fun Jackpot! This is too cute! So glad I found you on the blog hop! I'm a new follower! Thanks for the freebie! Thank you so much. This event is a huge help as I prepare to move from kindergarten to second grade. Thank you for the Economics freebie. Glad I found your blog. I am your newest follower. I missed the sign up for the blog hop but I have freebies on my blog and TPT store through Thursday. Stop by, grab a freebie, and enter to win a Thirty-One Organizing Tote. Thanks again! Thank you for the freebie. I love it and your blog. I'm now your newest follower. End of the Year Freebie!